Here we are, after a late start to the spring, closing in on April's halfway mark. And we have yet to enjoy a t-shirt and sandal day. I don't mean to whinge and whine, but it really is a bit disheartening to sit through days of cold and damp with nothing forecast but more of the same for the long-term. It's rather a good indication of just how gloomy this weather's been when you hear people getting excited about the fact that we may soon be in the 'double digits' for daytime temperatures. While I may have praised the beneficial properties of April's showers in a recent post, I didn't know that was all we could expect for this early spring month. Yes, it's making short work of the leftover dirt-smudged snowbanks. Sure, it's freshening the lawns and beds. Absolutely, it's going to have left the landscape squeaky clean when it finally quits. But when it's sun and warmth you crave, days and days of dreary and cold does wear on you a bit. 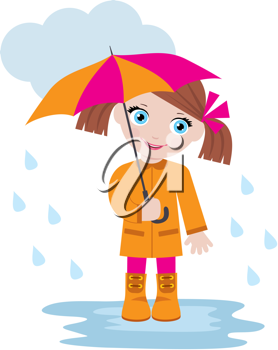 So, here's a collection of cheery rain clipart, many of which are just so adorable they're bound to put a little brightness back in the day.